I needed to replace Misha’s Busy Buddy Twist N’ Treat toy. It’s only a year old but she has worn it out. I bought a replacement but bought the extra small rather than the small. It was a bad choice. Her Busy Buddy is only a year old. However, she doesn’t play with it like other dogs. She doesn’t roll it around on the ground or move it from side to side to get the treats out. She opens it…in her mouth. It gets pretty gross pretty quickly. With all the tooth marks it doesn’t clean up well. Also, because of the way she opens it, it’s become difficult to turn. I can barely twist it open to put the treats in. Her mouth is stronger than my hands. When I ordered a new one, I chose the “extra small” size. I thought that was what I’d previously purchased. It is the one made for her sized dog. It wasn’t until I took it out of the packaging that I saw it was smaller than the original one. No big deal, right? She’s only 7 lbs. She doesn’t need a bigger toy. There is a difference and it could have caused my dog an emergency vet visit. What’s Wrong With the Extra Small? The extra small Twist N’ Treat has smaller slits on the top and bottom. It doesn’t seem like a big deal. I gave her the toy and within about 10 seconds I saw her have to give it an extra push to get it out of her mouth. As I kept watching, she did it two more times. The problem was that the toy was getting stuck on one of her teeth. She never had this problem with the larger toy. After she emptied it, I took it away from her. What if it gets stuck? She might end up with a broken tooth or an injury to her jaw. My dog panics sometimes. I could see us both getting hurt in the process. Nope. It’s not worth it. 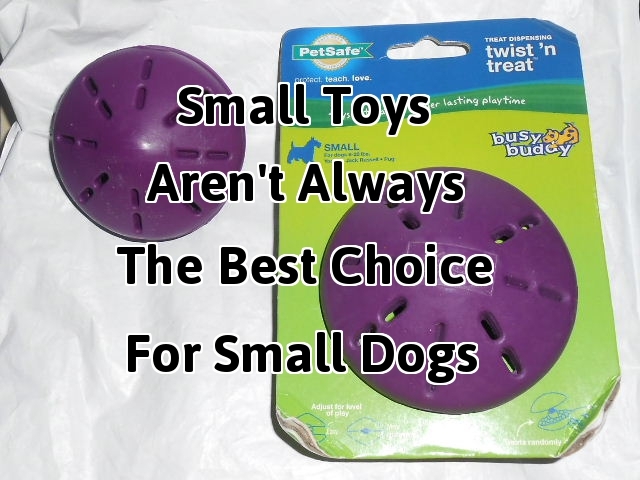 Here’s the lesson I learned… small toys aren’t always the best for small dogs. We think these toys are better for our tiny dogs, but sometimes it’s better to buy the larger size. That way small teeth aren’t a problem. Always watch you dog with new toys at first. I am glad I watched her play with it. Doing so, avoided an injury. 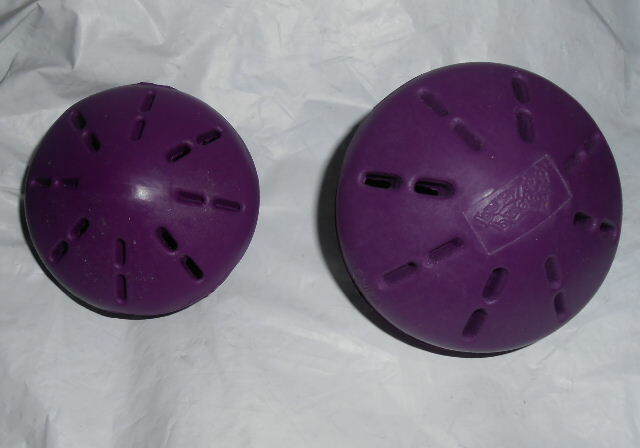 I sent an email to Busy Buddy, the maker of this dog toy. I wanted to let them know about the potential hazard with the extra small Twist N’ Treat. I received a very nice response with apologies. They will be sending my email to the appropriate person for review. They offered to replace Misha’s toy. We received a new one small sized one and it is perfect! Thank you Busy Buddy for going the extra mile and making my dog happy!